Our Counselor in Training (CIT) program is a unique initiative designed for youth (aged 15) who are seeking work, play and life experience in the field of outdoor adventure and education. With high levels of support, our CITs will have the opportunity for real-life leadership and work experience as a means to gain skills, knowledge and contacts to develop themselves as canoe guides, camp counselors, health & wellness instructors and positive, pro-active leaders in their communities. Why should I gain experience in the field of outdoor adventure and education? Summer jobs are a reality for most young adults between the ages 16 to 25, as you attend school and decide on your career paths - camp counselors, canoe guides, wellness instructors and day care/camp workers are a fun and dependable way to make money, friends and contacts during the summer season. In addition, due to the amount of character growth and healthy-living skills naturally inherent in outdoor education; individuals in this field of work can develop adaptable skills that will help them navigate the professional world with confidence, dependability and creativity. 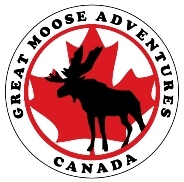 How can Great Moose Adventures help me to gain experience in outdoor adventure and education? True to the Great Moose philosophy, our CIT program is individually designed to meet the needs and goals of all of our participants. As such, specific activities, work tasks and leadership opportunities are specifically designed and facilitated based on an 'action plan' created for every participant with the support of their families and our team. Therefore, if your goal is to become a canoe guide, then we can focus our training and leadership opportunities on canoeing skills, swim coaching and life guarding, wilderness first aid, team building and campfire cooking. However, if you're more interested in health and wellness we can set goals with yoga, gardening, outdoor physical activity, healthy cooking etc. How much does the CIT program cost, what is the summer schedule and what is the duration? Option 1 - This is a work-in-training program, so there is no cost to the participant! Please be prepared to help out. Schedule: You can sign up for any session in the summer, but we ask that you come for at least 2 weeks at a time. Duration: Choose either 2 weeks, 1 month, 6 weeks, 8 weeks or the full 9 week summer! Please tell us why you want to be an CIT?